With much of Syria calm for the past 24 hours, a powerful Al-Qaeda-linked group sharply criticized the US-Russian-brokered cease-fire, saying Tuesday its real aim was to keep President Bashar Assad in power. The extremist group was in talks with other rebel factions for a possible merger, a move that could dash Washington and Moscow’s hopes of distancing it from the wider insurgency and sabotage the truce. The truce excludes Al-Qaeda’s affiliate, known as Jabhat Fatah al-Sham, and the more powerful ISIS, which are both designated terrorist organizations by the United Nations. The first week will be crucial: During that time, all fighting between Assad’s forces and the rebels is to stop, although Assad’s forces can continue airstrikes against ISIS and Al-Qaeda-linked militants. If the calm holds for seven days, the US and Russian militaries would then set up a new center to coordinate strikes against ISIS and the Al-Qaeda affiliate, previously known as the Nusra Front. The Jabhat Fatah al-Sham statement came a day after Syria’s largest insurgent groups expressed misgivings over the deal for excluding the Al-Qaeda-linked militants, who have been fighting alongside the rebels against Assad’s forces. A truce in February that lasted several weeks also excluded ISIS and Al-Qaeda-linked groups. In its statement, the Al-Qaeda affiliate accused the US-Russian-brokered deal of “conniving” to divide the insurgents and “target them one by one, while distancing Assad’s regime from the battle and preserving” his hold on power. “The aim of the Russian-American agreement is to defeat Syrian jihad, break its arm and cut its teeth,” the group said. Jabhat Fatah al-Sham has been working to improve its image and distance itself from Al-Qaeda. In July, its leader, Abu Mohammed al-Golani, publicly showed his face for the first time in a video in which he announced the group’s name change and said it was cutting ties with the international terror organization. 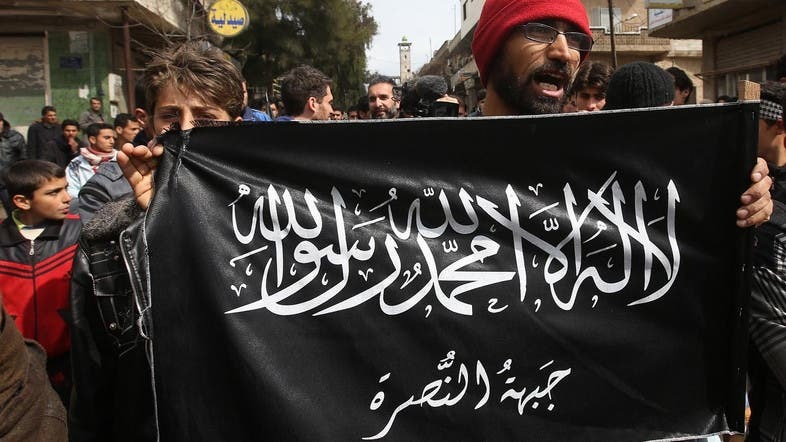 The group has been in talks for weeks to merge with other insurgent groups so that it can market itself as a Syrian faction - a move that would anger the United States, which has urged Syrian rebels to distance themselves from Al-Qaeda-linked militants. One of Syria’s most powerful factions, Jabhat Fatah al-Sham’s battlefield alliance with other insurgent groups makes it difficult for the United States to target them without the danger of inflicting harm to other opposition groups. A Jabhat Fatah al-Sham commander in the northern province of Aleppo told The Associated Press the group could announce its merger with the ultraconservative Ahrar al-Sham group “in the near future.” He spoke on condition of anonymity because he was not allowed to speak publicly about the talks. “The merger will not be bilateral.... It is a project to unify the factions on the battlefield. If it holds, all factions will melt into one,” said the official, who spoke on condition of anonymity because the talks are ongoing. Jabhat Fatah al-Sham is already part of the Fatah Army, a coalition that includes several powerful groups, including Ahrar al-Sham and the Turkistan Islamic Party. The coalition has been behind stunning attacks in the northern provinces of Aleppo and Idlib in recent months that left scores of Syrian government troops as well as allied Iraqi militiamen and members of Lebanon’s Hezbollah group dead since the February truce collapsed. The Britain-based Observatory, which relies on a network of activists inside Syria, said no one has been killed or wounded since the truce went into effect. It said more than 300,000 people have been killed since Syria’s 5 1/2-year conflict began. The U.N. stopped tracking deaths last year: Its last official count was 250,000 dead in a war it says has displaced half the country’s population of 11 million. Ahmad al-Masalmeh, an opposition activist in the southern province of Daraa, where the 2011 uprising against Assad’s regime began, said the province was relatively calm apart from four shells falling in rebel-held areas Tuesday afternoon. Syrian state news agency SANA said rebels fired three shells at a government-held neighborhood in Aleppo. It also reported shelling near the Castello road, northwest of the city, and the Ramouseh area in the south - both main arteries leading to Aleppo.